No science required, just study Sanskrit. No developments, only regaining of “ancient” knowledge. No wonder science budget is continuously being cut under the Modi regime. This is the same approach that leads to claiming knowledge of aeronautics in ancient India, based on a supposed text of Rishi Bharadwaj, which we know was composed only in early 20th century. As opposed to presenting such myths as science, we have the real advances in science and technology that took place in India, that is currently being rejected as anti-Hindu. Hyder Ali and Tipu Sultan are two pioneers in advancing rocketry. They used such rockets effectively against the British in the Anglo-Mysore wars. Roddam Narasimbha, one of the doyens of Indian aeronautics, wrote a detailed paper in 1985 on these developments. He discussed how British took such knowledge from India, and subsequently used it in their wars against the French and the British. Abdul Kalam, who according to the current Culture Minister, Mahesh Sharma, was a “nationalist” “despite being a Muslim”, accorded high praise to Tipu Sultan and Hyder Ali. In his autobiography, he talks about how, while visiting NASA’s Wallops Flight Facility, he discovered Tipu’s pioneering contributions to rocketry. 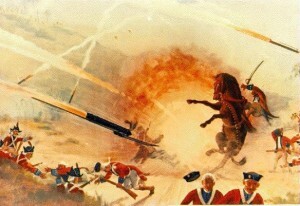 A painting of Tipu’s use of rockets against the British, is displayed in the main reception there. We will let stupidities such as ancient Indian aeroplanes “flying through air” between planets and “flying backwards” pass. What is important is what the Head of the Sanskrit Department, while defending the paper, said, that it was being presented by a pilot and therefore needs to be taken seriously. We should accept the scientific validity of the paper, because Bodas can fly an airplane! Not on the evidence on which these absurd conclusions were being presented; or any scientific examination of the concepts, or any analysis of the likely date of the so-called evidence. What mattered is that the speaker was a pilot – which he proves he can fly and not that he can read – and he endorses the claims of ancient Indian science, as long it is written in Sanskrit. Bodas’s claims are based on Vaimānika Shāstra, a Sanskrit text that was supposedly revealed to Subbarya Shashtry by the sage Bharadwaja through “psychic channeling”. Shastry lived from 1866 to 1940, while Bharadwaja lived at least 2,000 years before. The text, Vaimānika Shāstra, was extensively studied by a team of 5 professors from the aeronautical and mechanical engineering departments of Indian Institute of Sciences, Bangalore, who published their results in a journal (A critical study of the work “Vyamanika Shastra”, Scientific Opinion: 5–12, 1974). They spent a long time not only going over the text but also visiting Shastry’s birth place. Their conclusions were telling. Vaimānika Shāstra was not an ancient text. It was written in modern Sanskrit in the early 20th century, and not in Vedic Sanskrit. They also concluded that it was bad science, and nothing that was built as it was described in the above text, could have have ever flown. The statements such as inter planetary travel, proper diet for such travels and clothes to wear, etc., were all built out of the imagination of the author, that too a fairly poor one. The only evidence of antiquity of the text is the Shastry’s claim that the Rishi Bharadwaj came to him while he was in “psychic trance” and dictated the entire text to him. As opposed to such fantastic claims, let us see how Roddam Narasimbha researched Tipu and Hyder Ali’s pioneering advances in rocketry. In a paper, “Rockets in Mysore and Britain, 1750-1850 A.D.” presented in 1985, Roddam discusses the discovery of gunpowder and early rockets in China in the 11th century, the use of fire arrows and how they travelled to other parts of the world including India. Chinese used such rockets against the Mongols, who in turn, used it extensively in their wars against the Chinese and the Europeans in the 13th-14th centuries. Rockets fell into relative disuse after the discovery of the cannon in the 13th century, which were found to be more effective. Military rockets were used in India before Tipu. Hyder Ali commanded a rocket platoon of 50 in the army of the Nawab of Arcot, before coming to Mysore and seizing power from the Wodeyars. Roddam analysed Tipu and Hyder Ali’s major contributions to rocketry. He noted that they used metal casing for the rockets, instead of the then prevalent bamboo and paper casings. Such metal rockets could travel up to 2 Km’s, a huge increase in its range and had also greater carrying capacity. This allowed them to use sword blades tied to the rockets, and to stabilise their flight, much in the same way we use a long stick in our Diwali rockets. Such swords also served as weapons, when they landed among the enemy soldiers. Such rockets were particularly useful against massed cavalry and infantry charges. Tipu had built a huge number of rockets and used massed rocket attacks in his battles against the British. In Tipu’s 1780 battle in Pollilur (Second Anglo Mysore War), such rocket attacks played a key role in the defeat of the British. After Tipu’s defeat in the 4th Anglo Mysore War, the British carried away a large number of unused rockets to England, where William Congreve subjected them to a scientific study. Congreve then headed the Royal Laboratory at Woolwich Arsenal (the original home of the Arsenal Football Club). He found that the Mysore rockets had much greater range than any found in Europe. It was Congreve’s research – reverse engineering as we would call it today — and further development that lead to the use of rockets by the British against the French in the Napoleonic wars, and later against the Americans. Two such rockets that were carried back by the British from Seringapatam, are on display in the Royal Artillery Museum in Woolwich. It is also interesting to note what Roddam said in his paper, that Congreve could advance rocketry much further, because he could bring together science and technology and carry out systematic experiments, something that Indians could not do at that time. India had to wait for the founding of ISRO before it could carry forward the advances of the Mysore rockets. Roddam’s study shows us how history of science is to be treated. Not the vain glory of a mythical past, claiming aeroplanes 2,000 years back (now extended to 5,000 years) that go forward and backward, but meticulous research and analysis of what it really was. He also shows that such advances that took place in India were not in isolation, but built on the advances of others, and how such advances fed into to the larger body of aeronautic knowledge, and are very much a part of what we are doing even today. What the RSS or Hindutva brand of history of science does, is to talk of advancing, while looking only backwards. It is like driving a car, while looking only at the rear view mirror. No wonder they are filling institutions with people, whose credibility is zilch. Yes, India had a great tradition in science and mathematics. It can be restored only through quality science and not empty claims based on a study of mythology. We can build on our past traditions of science, only if we also accept openness to knowledge as a society. Half knowledged article, vaimanika shastra is based on Pushpaka viman from the Ramayana, even you are a athiest you can’t deny Ramayana is atleast 2000 years old, n according to your logic even if Mahabharata is 500 years it already described Embryonic transfer n birth science way before modern science…I feel its just your wanna be attempt to show the little knowledge that you have, try the same in another country n you are in for blasphemous laws..”Tolerance” of the land is what keeps you alive buddy..